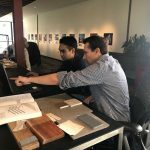 September is National Yoga Month, and we’ve rolled out our mats—blueprints that is—to review designs with built-in wellness centers. 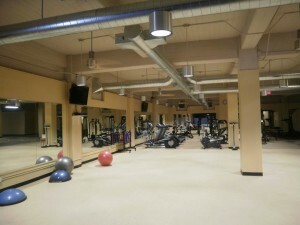 According to an article on selfgrowth.com, “10 Reasons to Encourage Fitness in the Workplace,” there are great benefits to having a wellness area for employee or member use. Those who are fit are less likely to get sick, have more energy and self-confidence, tend to have better attitudes and are less stressed. By keeping employees (or members) healthy, organizations tend to stay healthy as well. Members of the domusstudio team had the opportunity to work on one such project for the Port of San Diego in their eight-story building, located on Pacific Coast Highway. 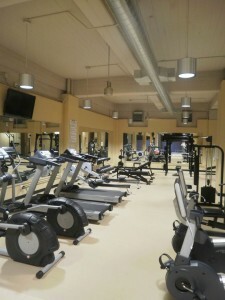 We utilized one of the building’s unused floors to create an exercise room, complete with space for stretching and practicing yoga. The nearly 3,000-square-foot area hadn’t been used for many years, so we redesigned the space to include new paint, mechanical, and cushion flooring for yoga. 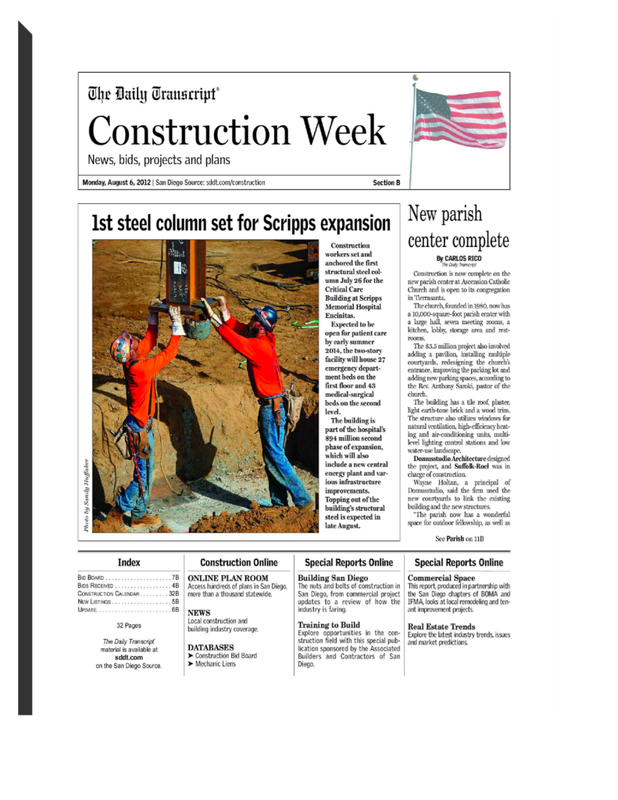 Six years ago, Malibu Presbyterian Church burned to the ground when the Canyon Fire swept through the community. 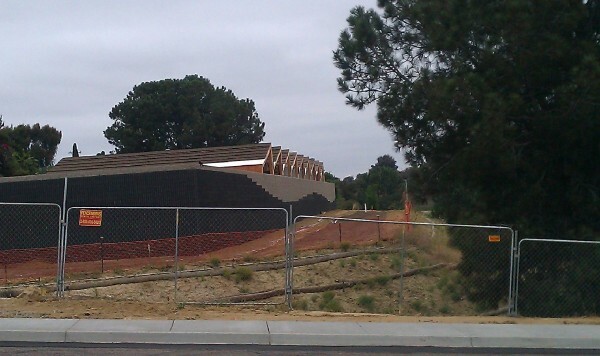 Today, the church is under construction, and early next year, the congregation will celebrate the completion of the rebuilding process in their new sanctuary. 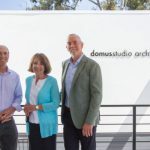 Domusstudio Architecture of San Diego spent a year designing the new structure, which utilizes the most current construction technology as well as features to improve the worship experience. The structure incorporates stone-clad exterior walls, rated for two-hours of fire resistance, a single-sloped copper roof and non-combustible materials throughout, he explained. In addition to fire safety considerations, Domusstudio’s team emphasized energy efficiency in the new design, using tinted laminated glass, high-efficiency lighting and mechanical systems to reduce the structure’s carbon footprint. Rev. Greg Hughes was at the church that morning on Oct. 21, 2007, when the fire raged over the hill. He and others there at the time grabbed documents and computers and got out safely. As they retreated, they saw embers ignite the steeple. Since then they have worshiped first in borrowed space and then temporary structures on the site. At the groundbreaking ceremony for the new structure in November 2011, he said, “The devil winds brought the fire that burned down our church. But that’s not the end of the story,” according to a Los Angeles Times report. Today, the church can look forward to a new chapter. In creating the sanctuary, Domusstudio’s architects used walls of glass to play to the natural setting in the hills above the Malibu beach with views to Santa Monica Bay. The architects kept a contemporary, casual feel to their design. They also wanted to make worship a memorable experience for the 64-year-old congregation, O’Brien said. Using resilient dampening isolators on the lower level’s walls, mechanical ducts, lighting, fire sprinklers and other mechanical equipment will prevent sound from traveling from the Sanctuary floor down to the lower level where Sunday school will take place during worship, he said. 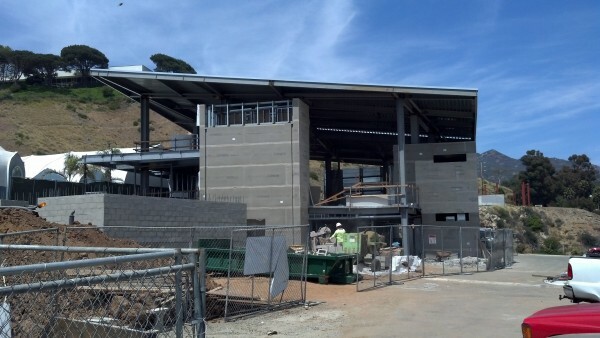 Charles Licha Construction of Pasadena is the general contractor for the project. 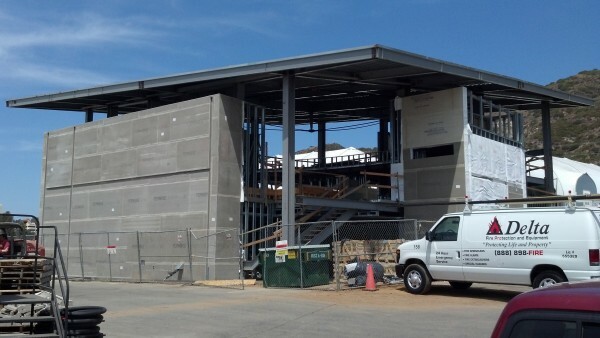 Encinitas Fire Station #2 is under way! 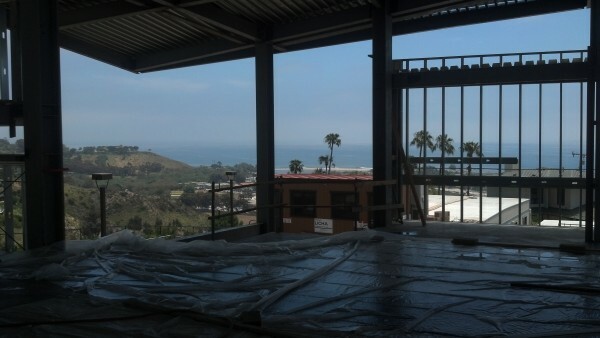 This project continues domusstudio’s relationship with the City, and when completed will complement Encinitas Fire Station #5 and Encinitas Fire Station #3 in the firm’s portfolio that are now serving the public. Here’s a Q&A with domusstudio architect Wayne Holtan regarding the status of the project. 1) What are the project basics? 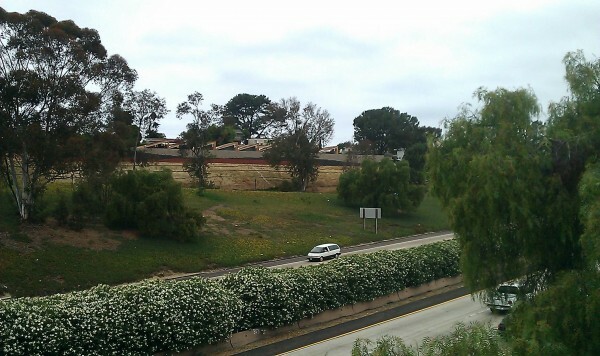 The new fire station construction is highly visible along Interstate 5 and the Birmingham Drive exit in Encinitas, specifically Cardiff by the Sea. This new project is a replacement for the outdated existing Fire Station #2 building, and is to be located east of the existing station site. The proposed new fire station will be single story, and 6,330 square-feet. 2) What inspired the design of this project? 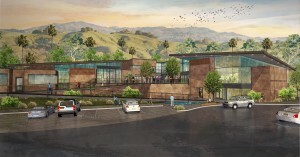 Conceptually, the sloping sawtooth roof lines and clearstory windows are intended to emulate Encinitas’s history of flower fields and greenhouses. To further project Encinitas’s historic identity, the Poinsettia flower will be represented graphically on the masonry wall. 3) Will the building incorporate sustainable features? The building will incorporate sustainable design elements that will align with the USGBC’s LEED Silver certification. Some of these key elements will be; use of regional building materials, clerestory interior day lighting, storm water quality control bios wale, drought tolerant landscaping and future installation of photovoltaic panels. 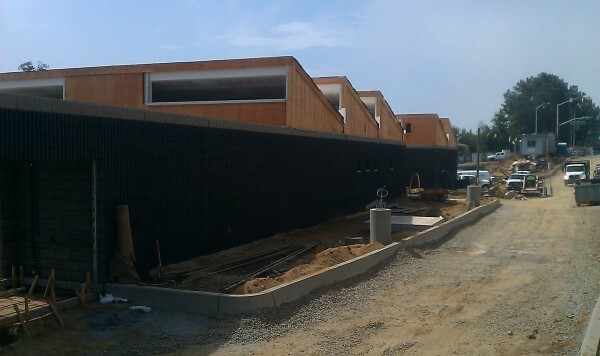 The building is designed to mitigate the freeway noise with the use of a continuous decorative concrete masonry wall fronting Interstate 5 with elements incorporated that respond to the freeway visibility. The colors will be shades of gray and the masonry is proposed to incorporate offsetting faces with heavy fluted textures. The roofs will be sloped, standing seam metal facing south to allow optimal sun orientation and efficient solar collecting by the future photovoltaic panels. Between the masonry wall and sloping roof, clearstory windows are formed that allow for effective interior day lighting. 4) Any other new and interesting features we should know about? Other features include a free- standing hose drying tower. The tower is cylindrical in plan and covered with perforated metal panels to enclose the hose drying lift. 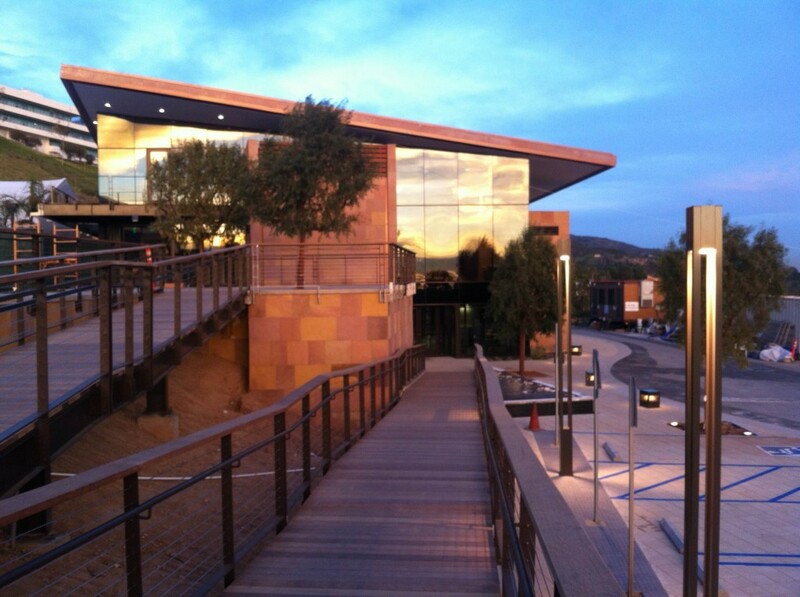 domusstudio has been the architect for many civil projects, including multiple fire stations, libraries and as the architect for many San Diego Symphony projects. 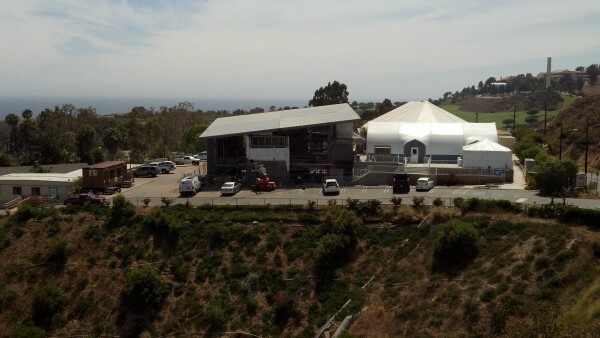 Thank you to Carlos Rico of the San Diego Daily Transcript for sharing news of a recently completed domus project, Ascension Catholic Church in Tierrasanta (as pictured to the right). 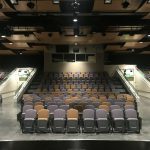 As shared in the article, the church, founded in 1980, now has a 10,000-square-foot parish center with a large hall, seven meeting rooms, a kitchen, lobby, storage area and restrooms. domusstudio designed the project, and Suffolk-Roel was in charge of construction. 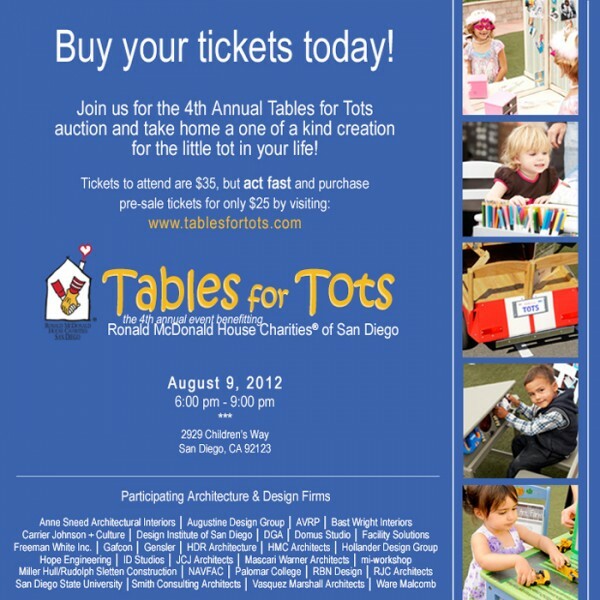 This year, we’re thrilled to be part of “Tables for Tots,” benefiting Ronald McDonald House Charities in San Diego! 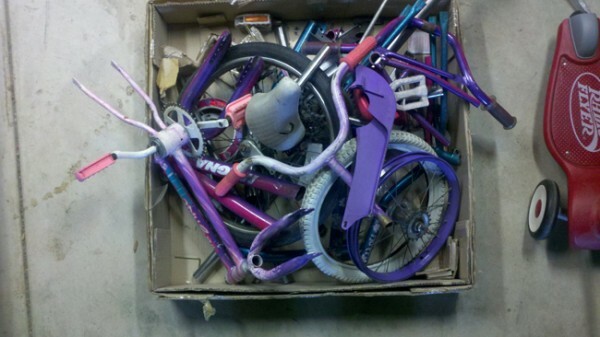 As participants, we were tasked with redesigning a child-sized set of table and chairs. What did we come up with? The Totcycle! 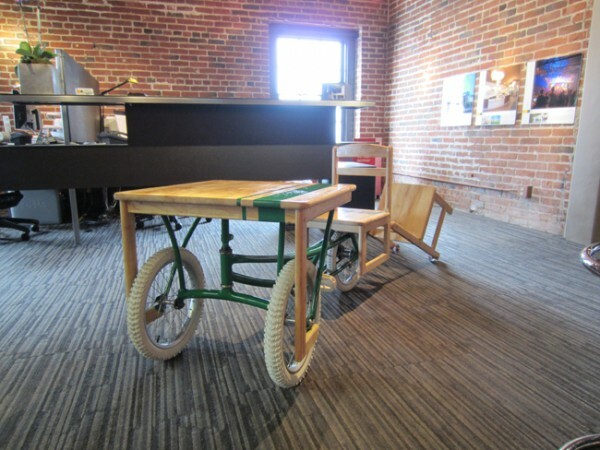 Inspired by historic ice cream carts, the cruiser is sure to provide an afternoon of fun and good humor! The concept for “Tables for Tots” was created by OFS Brands as a way to partner with the design community and raise money for local charities nationwide. 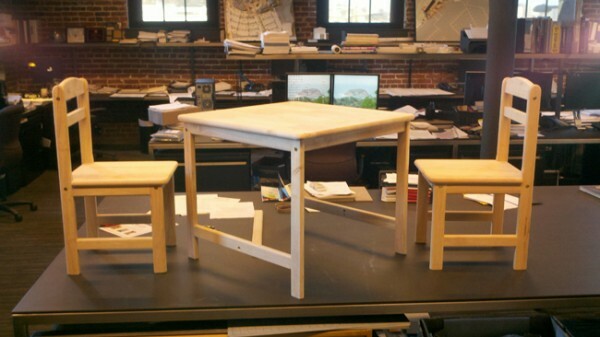 Local architectural and design firms, including domusstudio, received a child-sized set of table and chairs to design and decorate. Designs will be exhibited and put up for auction at this year’s fourth annual “Tables for Tots” event on Thursday, August 9 from 6:00 to 9:00 at the Ronald McDonald House (2929 Childrens Way, San Diego 92123). See below for ticket information. As design professionals, we pride ourselves in providing a wide range of services that on one side of the spectrum, yield the fundamental human need for shelter, and on the other side, will go as far as designing intricate gadgets like glowing pillows, stainless steel wallets, table-top fireplaces and wrench-shape key fobs that also act as bottle openers. Whatever you fancy, there’s most likely a design for it. But filtering down to a common denominator, all designers share the ability or the desire to solve problems. Solutions, grand or small, are what architects and designers strive for…and for some, perhaps a measure of self worth. How to integrate those with disabilities into our built environment so that they can function as productive individuals, without having to overcome not only their own challenges, but the physical challenges in which they encounter when walking through the front door. Well…what about the Americans with Disabilities Act (ADA) that has modified…to say the least… the way buildings are built in the last 20+ years. Has this not solved the civil rights issue of exclusion? In some ways…yes, this enacted law was a form of mitigation for the physically and mentally challenged. It has served as a catalyst (in the building industry) to ensure the basic accommodations for those who need the support. But in complying to ADA requirements with respect to building codes, costs associated with these provisions can add up, not to mention physical space allocated for code compliance can increase substantially. It is no wonder architects and designers scoff at the idea of implementing something that ultimately may detract and possibly hinder their grandiose vision. It is this conviction that many have such negative attitudes toward something that may have the potential to enhance one’s design. After all, is it not the architect and designers who boast their creative abilities (problem solving abilities) to transform everyone’s way of living? To innovate and inspire with their design sensibilities? To create not only form but concepts like ‘place-making’ that provoke thought and emotion? Is it not this disposition of elevated competency, sufficiency, and…(shall it be dared said…egotism? ), that should be the driving force in tackling this little issue of integration for the physically challenged? Perhaps there should be a sense of professional, if not personal responsibility for inclusion…putting aside the mandated ADA measures. If we see a problem, shouldn’t we fix it? However…is it a ‘problem’ if it doesn’t directly affect you and I? Well, if it doesn’t directly affect us, then we tend to turn a blind eye…out of site…out of mind (problem solved! )…it’s only human nature. Believe it or not, there are individuals who genuinely have trouble over the simplest things we all take for granted such as being able look over counters, allowing everyday transactions to take place. But here’s the point– should we have waited for ADA measures to take place (as related to building codes) dictating a substantial amount in what architects and designers are allowed or not allowed to do? Or should it have been the building and design industry to take this under its wings in a celebratory manner and possibly perceive it as a problem-solving mission? Perhaps with the latter, there may have been more authority and control in the direction for these measures, and in turn, may have more endorsement from architects and designers with a sense of compassion. Lowering a counter height may break a designer’s ego, but if we embrace the fact that not all of us are equal, perhaps the ADA stigma may dwindle to a point of no return.